Sew new beginnings deep within. In my research about the Wolf Moon, this rite struck me as just perfect to begin my year long full moon journal quilting adventure. The full moon on the night in question was shrouded in clouds, but the moon shown through, creating these amazing rings of color around herself. This is represented by both layers of fabric and of thread – 8 different fabrics and 4 different threads. The clouds seemed the carry the glow of the moon far beyond what we would normally see. Also, that night, the moon was huge, the largest we will see all year; as she passed on her closest path to the earth. In years past, this was the time of year when families huddled together for safety and warmth, with wolves howling outside – it was the most difficult time of year, the winter was in full swing; food was beginning to run low; the wolves were particularly fierce in their own hunger. Originally, I was planning to place a heart, to represent the family, swaddled and protected by the layers of the moon, but it seemed too trite in the end. I liked the starkness of this image, it leaves the story open for interpretation. 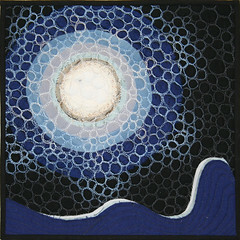 Tagged 2009, Art, black, blue, cloud, cloudy, Cold Moon, cotton, felt, free motion, full moon, fuzed, glow, linen, polyester, Quilt, Quilting, raw edge applique, silk dupioni, Snow Moon, stark, thread, Wolf Moon. « New clothes for me!